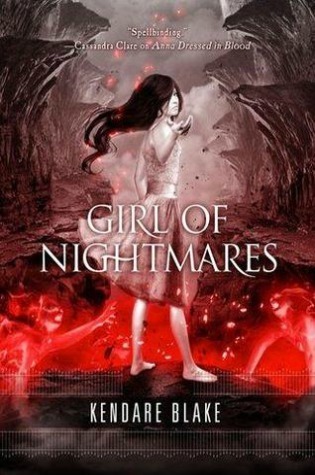 Girl of Nightmares is the sequel to Anna Dressed in Blood. And by sequel, I mean the end. Why is it that so many lackluster series stretch out over three or four novels while some strong series choose to stop at two when the readers clamor for more? On the bright side, Girl of Nightmares is a different yet equally interesting book than its predecessor and ties up all the knots in a satisfying manner. Cas starts off this novel in a very different place than he was at the beginning of Anna Dress in Blood. Previously, he was a lone gunman, or lone ghostbuster, if you will. Now he is firmly ensconced as a member of a trio of friends: Cas, Thomas, and Carmel. And he is despondent over the loss of Anna, the ghost with whom he fell in love. Things become disturbing when Cas realizes that Anna is not at peace. She is being tortured by the Obeahman, a demon-like super-ghost in a hellish underworld. Cas embarks on a new journey to rescue Anna from an eternity of pain. But enemies await both above and below ground to thwart his way. I love the dynamics between Cas, Thomas, and Carmel. Thomas is awesome in his geeky side-kick goodness. Carmel pushes Cas and Thomas to be more - to be more involved in school, to go further along the ghost-hunting journey. She's a more forthright person than Thomas. But she struggles in this book to balance the happy, normal life she used to live with the more violent, dangerous one she threw herself into. It's much more realistic than having a character newly introduced to the paranormal world happily become entirely immersed. Unlike Thomas, Carmel had no exposure to witchcraft or the ideas of ghosts. And also unlike Thomas who was a loner prior to Cas and Carmel, she had less to gain. We also meet a new character: Jestine, who is ambitious and eager to take on (or perhaps usurp?) Cas's ghost-buster role. She's funny and charming but she's also ambiguous in a way that makes you want to keep reading. Like we saw in Anna Dressed in Blood, Girl of Nightmares has plenty of action and lots of gore. I didn't find it scary at all, but horror doesn't usually frighten me. But I know many readers consider both books very scary, so it's probably just me. Regardless, there is tons of action and many surprises. The book moves at a steadily fast pace, but not so fast that I'm flipping through the book so fast that I hardly read it. Putting the action aside, the highlight of the series for me is Cas's voice. He's sarcastic and full of dark humor. My only (sort-of) criticism is that there is a lot of swearing in this novel. It's not so much a criticism as it is a notice. The swearing does not feel gratuitous. Cas talks in the same way that a lot of teenage boys do. But it's enough swearing that it stands out from many other books I read. If you liked Anna Dressed in Blood, you'll definitely enjoy Girl of Nightmares. Cas is lovable in his own dark way. You'll root for him to destroy the Obeahman for good and bring Anna to peace. Plus for Cas to find his own peace, his own place in the world. I haven't read the first one yet, but I want to. The dynamics between the trio sounds great! Like you, I never really found either that scary, only gorey, especially Anna Dressed in Blood. I liked this one a little less than the first one. I liked the trio's dynamics but I was never a fan of Carmen. It's much darker and sombre because there was never really a chance between the two of them. I felt really hollow and super sad by the end of the book. I stayed away from this because I heard how scary they are, but I am easily scared :) The action sounds good though, so I think I should brave these and give the short series a go! Awesome! I still have to read this one but I loved the first Anna! Glad to see a good review on this one, the last few were so-so ones. Great review! It's sad I haven't read this one yet, considering how much I loved the first one. Plus, Thomas, FTW!! I have not read the first one- but these sound interesting. Glad you enjoyed this one Alison! I didn't notice the swearing so much, but then again it's been a while since I've read this, so maybe I did and have since forgotten. It's entirely possible. I wish there was more Anna in this book, I missed her, but I just loved Cas, Carmel and Thomas:) Fantastic review! I'm rarely scared when reading a book either (although Stephen King has gotten me a few times...) But, I did really like both of these books. It's more of a creepy feeling that I get, I guess. I enjoy that. Great review! I didn't really like this one as much as the first. It was good and I liked the direction she took a few things but I didn't find it as creepy or satisfying. As much as I like Cas, this series is all about Anna to me and I missed her presence. Totally agree with you on this book. :) Loved the horror and creepy of it. i agree about the swearing too ...it was a bit much. I just read this book as well and loved it! I completely agree that some series seem to stretch out too long, while the ones that just have two more often than not leave the readers begging for me. I would not be upset to see another book about Cas someday in the future (though it's unlikely, since Blake is writing the Anti-Goddess series). I agree it wasn't too scary, but I love horror. It was a good read. Carmel and Jestine both bothered me though. I understand where Carmel was coming from when she did what she did ... but I didn't think she did the right thing. Particularly when she took it back so quickly. Jestine ... I just didn't trust her. I couldn't enjoy her character when I was wondering the entire time whether or not she'd stab Cas in the back. Great Review! I must find this book at an online bookstore..! I read, and loved, the first book of the series. I did start reading this one and just couldn't get through it. Maybe I'll revisit it based on your review. Thanks!